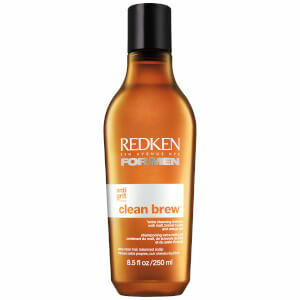 Redken Brews Daily Conditioner hydrates and strengthens all types of dry hair. This conditioner for men moisturizes, strengthens, and doesn't leave the hair flat or weighed down. Redken Brews Daily Conditioner also includes Protein for strength and Glycerin for moisture and hydration. After shampooing, apply and distribute through wet hair. Rinse thoroughly. Aqua / Water / Eau, Cetearyl Alcohol, Behentrimonium Chloride, Starch Acetate, Cetyl Esters, Parfum / Fragrance, Isopropyl Alcohol, Hydroxyethylcellulose, Sodium Benzoate, Salicylic Acid, Linalool, Limonene, Hexyl Cinnamal, Amyl Cinnamal, Hydrolyzed Malt Extract, Sodium Hydroxide, Hydrolyzed Soy Protein, Butylene Glycol, Pentylene Glycol.